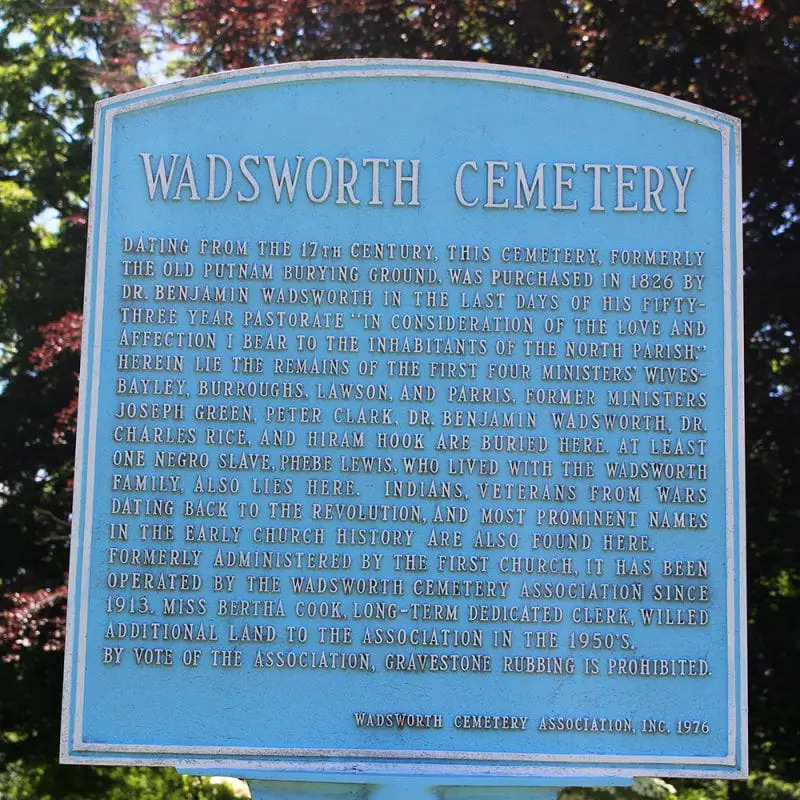 This cemetery was formerly known as the Old Putnam Burying Ground. Benjamin Wadsworth, the 7th minister of the First Church of Danvers (North Parish) which he served for 53 years, purchased it in 1826. 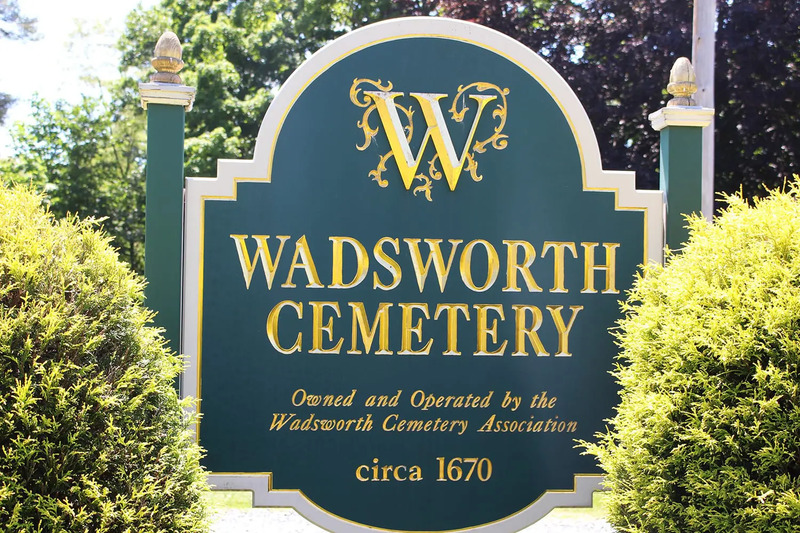 It has been operated by the Wadsworth Cemetery Association since 1913. The wives of the first four ministers of Salem Village are buried here. In graves that no longer bear markings are: James Bayley’s wife Mary née Carr; George Burroughs’ first two wives Hannah née Fisher and Sarah née Ruck; and Deodat Lawson’s wife Jane (maiden name unknown). Reverend Samuel Parris’s wife Elizabeth’s gravestone is just barely readable today. Located on Summer Street (7-29), about 1/10 of a mile north of its intersection with Maple Street Rte 62). Also buried here are Danvers ministers: Reverend Joseph Green (1674-1715), Peter Clark, Dr. Benjamin Wadsworth, Dr. Charles Rice, and Hiram Hook. 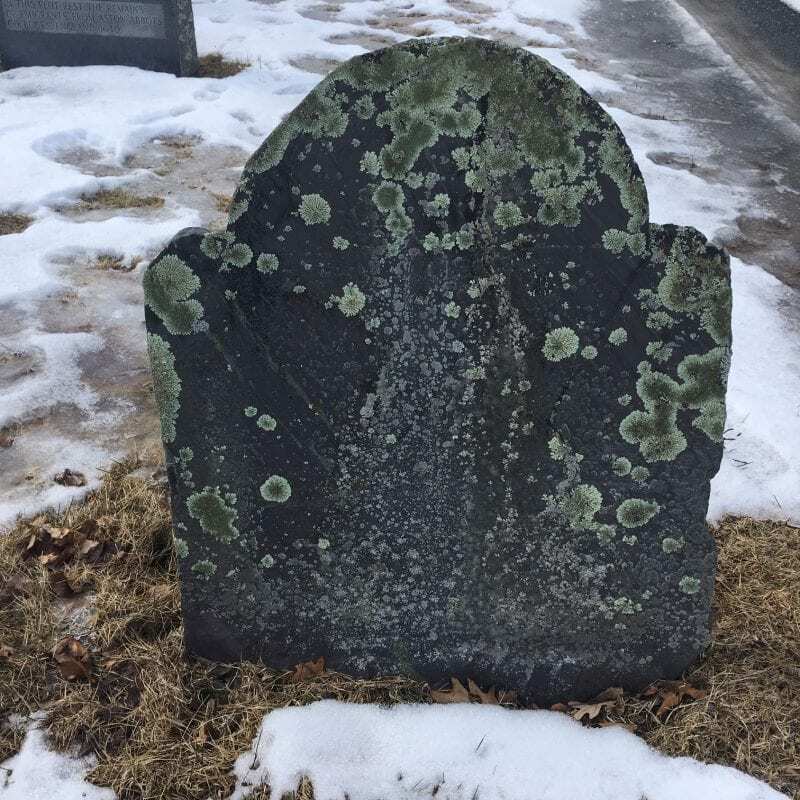 Here is the gravestone of Elizabeth Parris, photographed in the winter of 2019. The inscription is barely perceptible. Here is the gravestone of Elizabeth Parris (née Eldridge), more readable in bygone days. Photo by Tina Jordan, 1995. 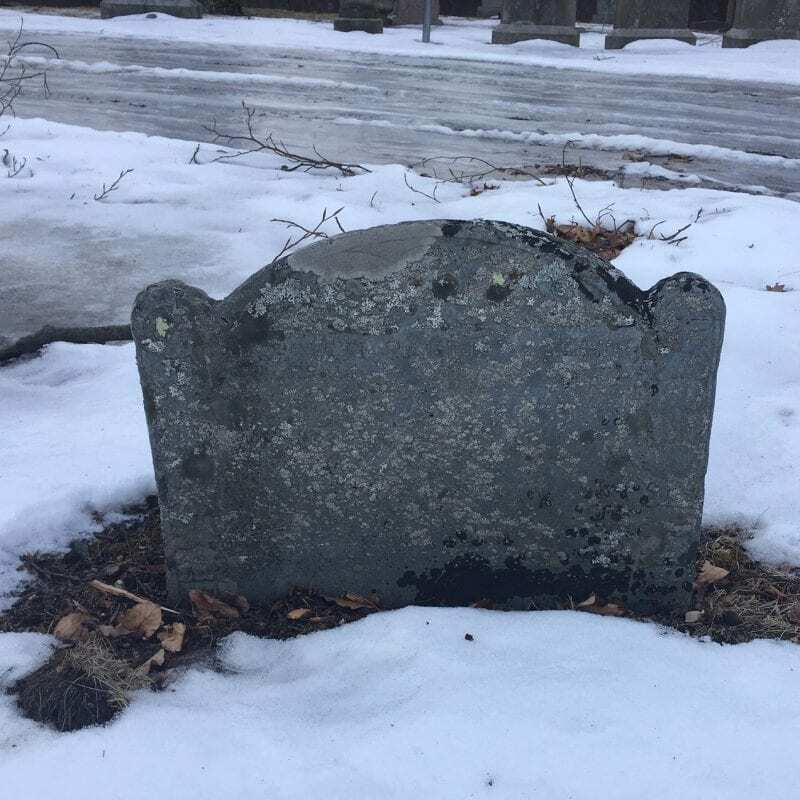 Here is the gravestone of Reverend Joseph Green, photographed in the winter of 2019. The stone is barely legible. Here is the gravestone of Joseph Green, photographed by Sherrie Kling in 2012. Used by permission. 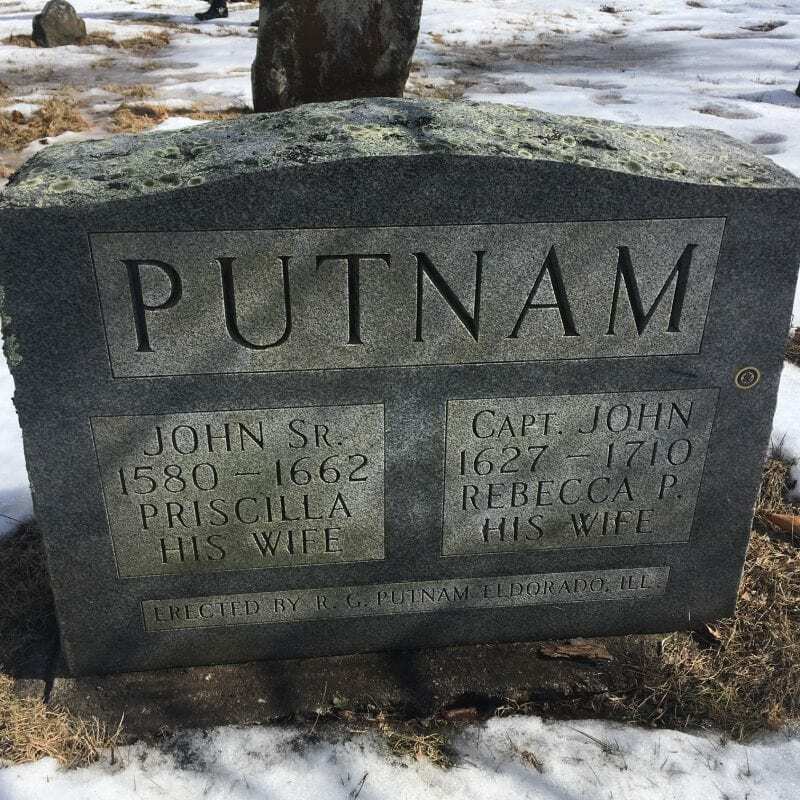 This stone marks the graves of the patriarch of the Putnam family, John Putnam Sr., and his wife Priscilla. Also here are the graves of his son Captain John Putnam and his wife Rebecca. George Burroughs and his wife Hannah lodged with Captain Putnam when they first arrived in Danvers, before the parsonage was built.